Just a few minutes from town and ski slopes, yet immersed in nature. Moose, elk and so much wildlife roam the mountain. World class trails for hiking, cross country skiing, mountain biking, snowmobiling....all from the front door. Log home sits on five and a half acres, surrounded by mountains and national forest. Located two and a half miles from Breckenridge Village makes the location close to everything the town and ski slopes have to offer. But the best part is you will be nestled in your mountain cabin home, away from it all. Surrounded by historic mining ruins make the location interesting and nostalgic. Remember, this is how Breckenridge began over 150 years ago! The house is built with hand crafted and peeled chinked logs from Canada. A comforting wood burning stove sits in the center of the main floor for character and comfort. It creates a warmth in the winter that gathers everyone for a movie, meal or game of pool. From any window you'll experience a breathtaking view of the Rocky Mountains and national forest. The kitchen is completely stocked with everything needed to prepare any size meal. Easy access ground floor ski entrance with cabinets and racks for equipment. Maps of Vail, Keystone and Breckenridge line the walls to make it easy to plan your day. We love the mountains because they are wonderful all seasons. There isn't a time of year we aren't ready to drop everything and visit Breckenridge. Hiking, distance biking, mountain biking, skiing, snowboarding, white water rafting, snowmobiling..... The activities and exploring is endless! Location! The log construction is so unique to the mountains, the log burning stove is beyond charming and is in the center of the main floor, so much better than in a corner or on a wall. The ski entrance is awesome. The hot tub is private and the views are so pretty. It's location makes it wonderful.....we see mountain wild life all the time! Obviously there are many other homes in the Breckenridge are with mountain views and convenience to slopes. But they are almost always close to other houses, often very close. This is not the case with this home. It really feels like a mountain home, boasting views of the ski runs from the living room. It's quiet with a cozy feel, , nestled in the mountain forest. The old mining bunkers by the drive remind us of Breckenridge history. Minutes from Main Street down town Breckenridge, all it's ammentities and ski lifts. The best part! The property is situated within national forest property, so even though you're a few miles from town, you feel like you're a hundred! 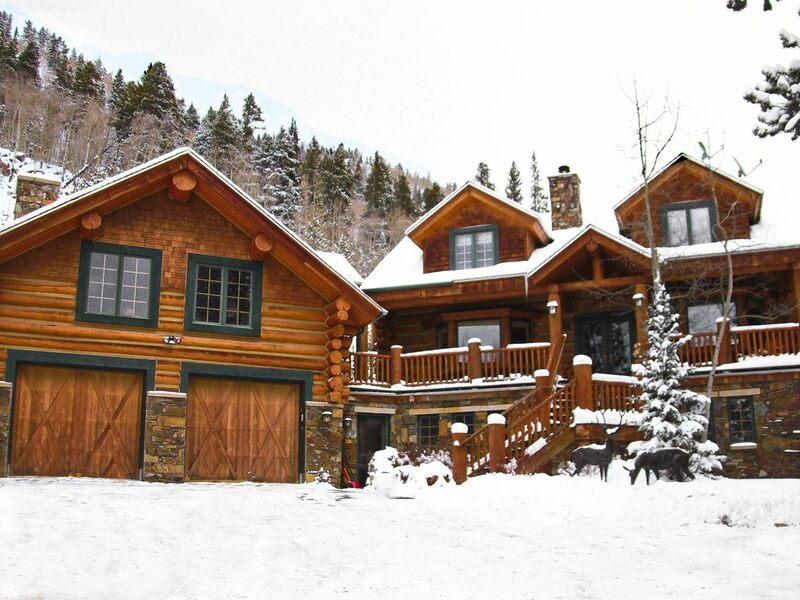 For cross country skiers, this is a ski-in/ski-out property. The house Is surrounded by national forest and is considered to have some of the best cross county ski trails available. For down hill skiers, Breckenridge slopes are just a few miles away. Either drive to public parking or catch the bus about a mile or so from the house. No need for air conditioning in The Rockies :) The mountain air is everything! Plenty of parking in drive and off street. Kitchen is fully equipped to prepare anything! Kitchen dining table seats 8, additional chairs are available. Kitchen bar has 4 seats also. There is a television w/cable in the living room and master bedroom. Lots of games stored in the living room coffee table. As well as a pool and foosball table. Best thing about the yard are the wild raspberry bushes that grow. Fun to pick them and make pancakes or muffins for everyone....plenty on the property and also along the mine trails by the house. There is plenty of water activities in the Rockies. White water rafting, kayaking, canoeing. There are many local companies that take groups on different rides. Hot tub tucked in the mountain on back deck. Any ski/snowboarding equipment at the house is ok to use. Beautiful home! Plenty of room, awesome hot tub, everything we needed. Nicolas took great care of us. He clearly works very hard to keep this home beautiful and customers happy! The cabin was beautiful and you couldn't ask for a better view of the mountains. We had 11 people and there where plenty room for everyone! My grandchildren had a blast in the snow. Charming mountain home with everything you could need. Wood fire really warms the house through. Close to trail through National Forest - great for walking / snowshoeing / cross country skiing. Property manager did a great job of keeping drive clear of snow. Good location for ski resorts at Breckenridge, Vail, Copper Mountain and Keystone. Would return again. Really loved our stay! The house is exactly what we want in a mountain getaway. Nicely furnished and so many extras. The trails out the front door are awesome, town is minutes away. Private home with wonderful views. We will be back this summer and will recommend this place to others! Thank you to the owners and property manager for everything! Best view in Breckenridge! Plenty of room for the whole family. Beautiful Log Home. It was extremely cold outside, but with the wood stove it was so comfortable inside. Nick the caretaker was very helpful and a great family vacation. This property is beautiful! It’s roomy enough for a large family but still feels cozy. The short drive into town was not a big deal at all. The kitchen is well appointed but does need a new oven rack. The only other problem was slow and at times nonexiistent internet. This is a problem if any in your group need to work remotely as our son in law did. Otherwise it’s the perfect mountain getaway!! In the winter months there is world famous downhill skiing, sowboarding & cross country skiing, ice fishing, snowshoeing, snowmobiling & horse-drawn sleighrides. Summer activities include numerous world famous golf courses, hundreds of miles of hiking and biking paths, gold-medal trout fishing, alpine slide, goldpanning & goldmining, All year round you have a fitness center and indoor ice hockey rink, superb restaurants, live symphony, sightseeing & swimming, Also available is free shuttle to 5 ski resort areas & activities. Breckenridge is an extremely popular resort located in the largest historic district in Colorado. There are 2378 acres to explore at Breckenridge! Intermediate runs and cruisers come in clusters, especially around Peak 7 and Peak 9. Recently expanded Peak 8 takes you to extreme terrain you could previously only hike to. If you like bowls and chutes, this zone is where you’ll want to go for most of your riding. Breckenridge also has 5 professionally maintained terrain parks, complete with halfpipes and superpipes. Though the ski resort and town have transformed Breckenridge, it has kept its relaxed and casual atmosphere of days past. An old mining town, old Victorian houses can still be seen, and mine merchandise can still be found in local stores. If you are looking for night-life activities, you will have no trouble finding them with over 40 bars and pubs in the slope-side town. Overall, Breckenridge is a great place for both beginner, expert and intermediate skiers and snowboarders alike and the town offers a nice change of pace from the action packed slopes!